The second winner of a £25,000 Tattersalls October Book 1 Bonus at Chelmsford City last night and the 39th this year was the Sir Michael Stoute-trained PARLANCE who won the totequadpot Maiden Fillies’ Stakes in impressive fashion. Under the guidance of Ryan Moore, the daughter of INVINCIBLE SPIRIT earned a total of £29,204 for her owners Cheveley Park Stud. 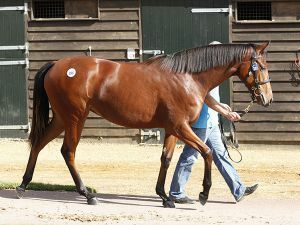 The well-related filly is out of PLEASANTRY, a half-sister to Europe’s Champion three-year-old colt in 2014 KINGMAN as well as Group 3 Tercentenary Stakes winner REMOTE, from the Juddmonte family of OASIS DREAM. Consigned by Oghill House Stud, PARLANCE was bought at Book 1 of the Tattersalls October Yearling Sale by Cheveley Park Stud for 450,000 guineas.